Archbishop Bostwick, of DeForest, WI, went to be with the Lord on Sunday, March 8, 2009, at the age of 59 years. Archbishop Bostwick was born on August 14, 1949, in Watertown, WI. He was the son of Lawrence and Isabelle (nee Roedl). He was preceded in death by his parents and brothers Michael Bostwick and Glen Klockow. The Archbishop was survived by Fr. Charles Walders, his Episcopal Chaplin and long time companion. Survived by brother and sisters Betty (Edwin) Barrett, Lyle (Bonnie) Klockow, Carol (Elmer) Boettcher, Larry (Colleen) Klockow; and sister-in-law Barbara Bostwick. 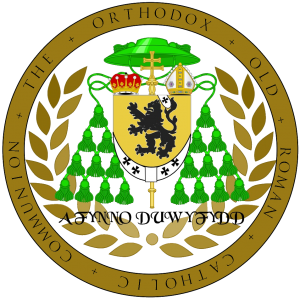 The Archbishop is also survived by a host of nieces, nephews, brothers, deacons, priests and seminarians of the Old (Roman) Catholic Church of America. Visitation will be held at the CATHEDRAL CHURCH OF THE HOLY ANGELS, 1510 N. 70th St., Wauwatosa, WI 53213, from 12:00 noon on Wednesday, March 11, until 6:00 PM. A Prayer Service will follow the visitation at 6:30 PM. Also visitation on Thursday, March 12, from 8:00 AM until 10:00 AM, at ST. MARY MAGDALENE CHURCH, 242 William St., Johnson Creek, WI 53038. A Solemn Pontifical Requiem Mass will be held on Thursday, March 12, at 10:00 AM. Burial will take place following the funeral at the church cemetery.